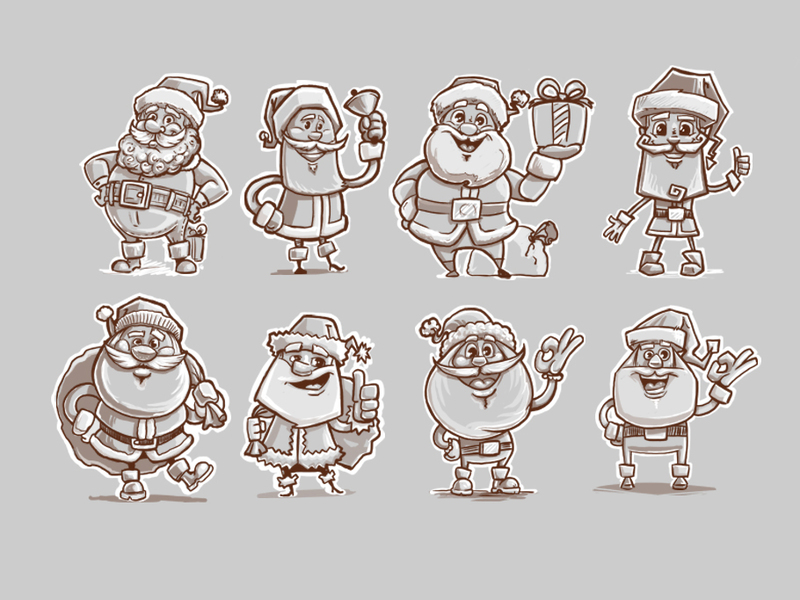 Character’s personality is a crucial part of creating engaging, believable and likable designs. It is not enough to have beautifully drafted character, but your audience should be able to relate to it and “connect”. Since the dawn of humanity, people memorize things by storytelling – we just love stories! So it is no wonder that we also look for the personality and the story behind characters as well. 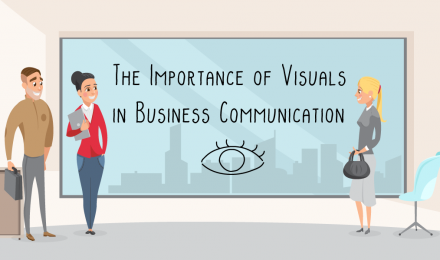 Designers are more and more concerned of how to convey the personalities and the tale of the characters. And we don’t blame them, since it’s proven, that designs with a story and “character” get far more positive responses and engagement from the audience. Back in 1946, Solomon Asch wrote a paper on how the impression of the physical appearance affects the impression of personality traits. In this article you will learn how artists mix different techniques up to create engaging characters using their physical appearance. Some of the most important tools they use are shape, variance and size. Get these down right, and your audience will easily relate to your designs, and … probably fall in love with them! Let’s start big, before going into details. David Colman, an Emmy winning character designer found in his practice and researches, that facial expression is really secondary when reading a character. First thing to notice is the face shape, posture and body language (not so much shape of eyes, eyebrows, mimic, etc). Communicating a personality through body language and silhouette is far more powerful than only showing emotion through facial expression. 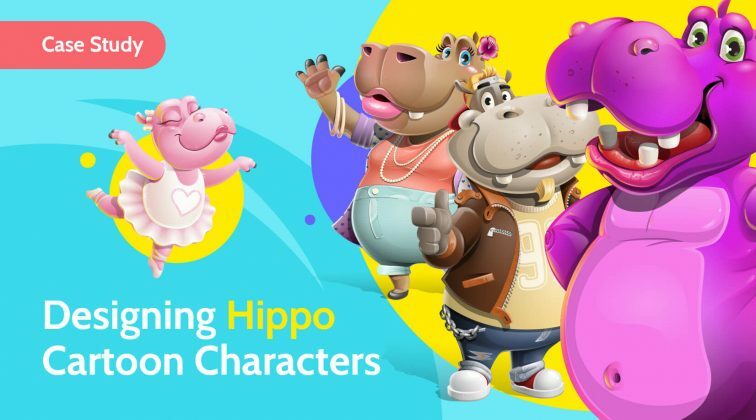 That is why, we will first look at primary shapes used to design the head and body of characters ( the bigger picture) and then we will go into the details. Although, color can be interpreted in different ways from culture to culture, it seems shapes have more universal meaning across the globe. 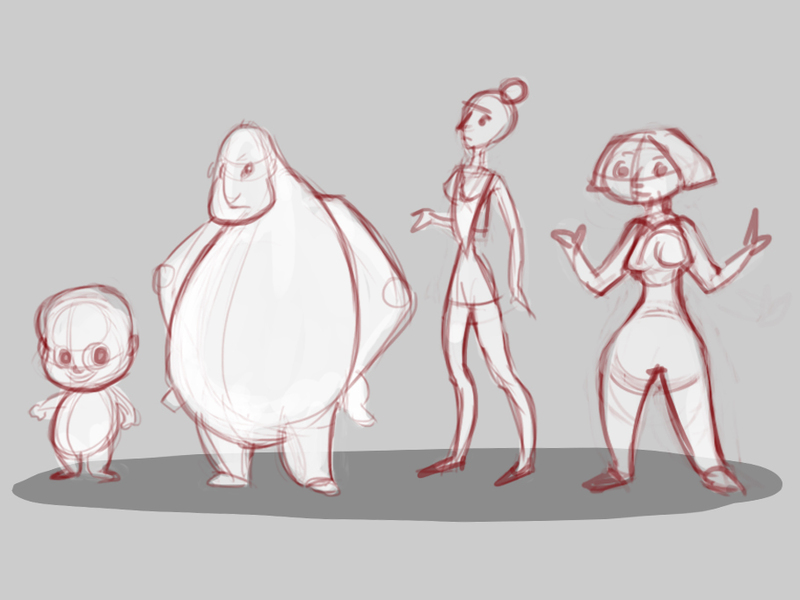 Any character could be broken down into primary shapes onto which we are projecting our real life experiences. We often subconsciously assign qualities to a person or a character by only perceiving him/her as a combination of shapes. The square shape is often found in nature as solid shape of rocks, mountains and it is usually perceived as something stable and heavy. You can often see in the physical appearance of strong and masculine characters and warrior square or rectangular shapes. There are cases too, where the character is not a macho/hero, but the designer are using square shapes in his body too, to project his solid, stable and may be stubborn personality. Another qualities often assigned to a character’s personality, because of their square shape are dependability and confidence. Think of the sense of touch, something instinctive and natural. We inherited the perception of oval shapes as safe and soft, on the contrary, angular shapes are warning for possible danger. Let’s focus on the ovals for now, and in the next section will talk about the triangle primary shape. Most of the well-known protagonists are designed around oval shapes, as this shape is perceived as friendly, safe and harmless. The oval shapes are often present in baby’s characters – children and animals, in chubby adults and so on. Have a look at Remy’s brother from Ratatouille – both of them mice, but the first is much more rounder to convey his soft and bit naive nature of character. Next is Russel from Up – his whole body is made of soft, round shapes and it is used as a contrast to the square body of Carl. This is yet another technique to underline someone’s personality, by putting him next to another character. Last but not least, Owlbert is one of our friendly and cute characters at Graphic Mama, who is for sure a great helper and a good friend! Angular shapes has always projected danger. They are found around us as torns, pieces of glass, rocks eroded from severe climate conditions, you got the point. That is why, often designers use triangles and pointy shapes in their villain character’s personality. Very good representatives to illustrate that concept are Maleficent and Jafar. Triangles also give direction. In contrast to squares, where we have only 2 directions-vertical and horizontal, here we have 3. Besides using them for portraying horrifying character’s personality, artists also use them to show a hero’s determination, drive and opportunism. This is the case with our Angleina Justice character at GraphicMama and Peter Pan. Often, for building more complex character’s personality, more than one shape is needed. So artists use combinations of shapes instead. The variations are endless. Strong, powerful character (square), but also mean (triangle) or big hero (square), but soft at heart (circle) – it’s your pick! Remember we said we are going to go in the details too? 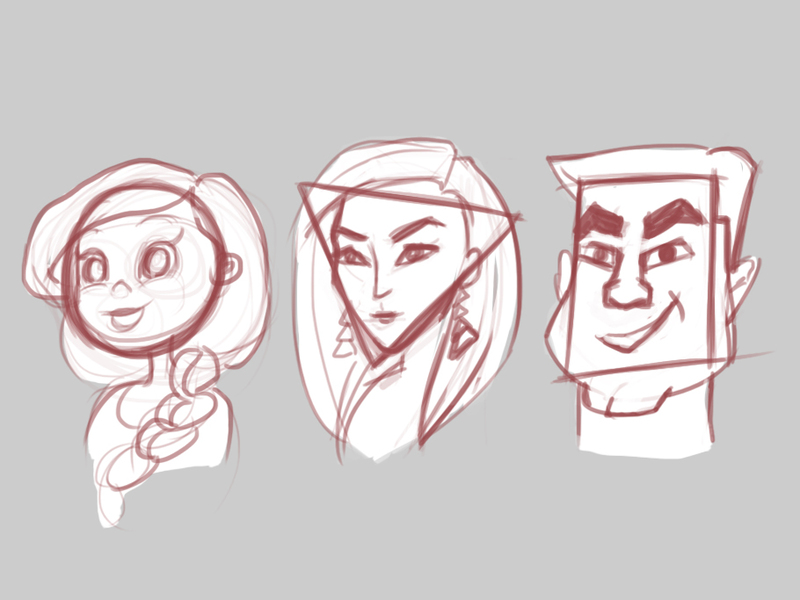 So here is an example of the different shapes used on a smaller scale – in the facial features of a character. What do you think they say about the character’s personality? What you can notice from these thumbnails is, that usually babies have large, round heads and small bodies, which makes them so adorable! A small head, with a heavy, pointing downwards body depicts a may be not so smart but physically capable and strong character. A woman’s character designed with the help of triangular shapes easily comes across as active, athletic and driven. On the contrary, woman with heavier lower body and overall round features will suggest a soft, compliant character’s personality. One more factor which can make your designs more appealing and attractive is using the size relationships in your character. The road to good design is often paved with different in size shapes, combined in an interesting and unpredictable way. The first example (a.) is of shapes, similar one to another, stacked up on top of each other in progression, which is a bit boring to look at. Then the same shapes (b. ), but varied in size are put together in more interesting way (first is the medium in size shape, the smallest and finally, the largest). Much better! 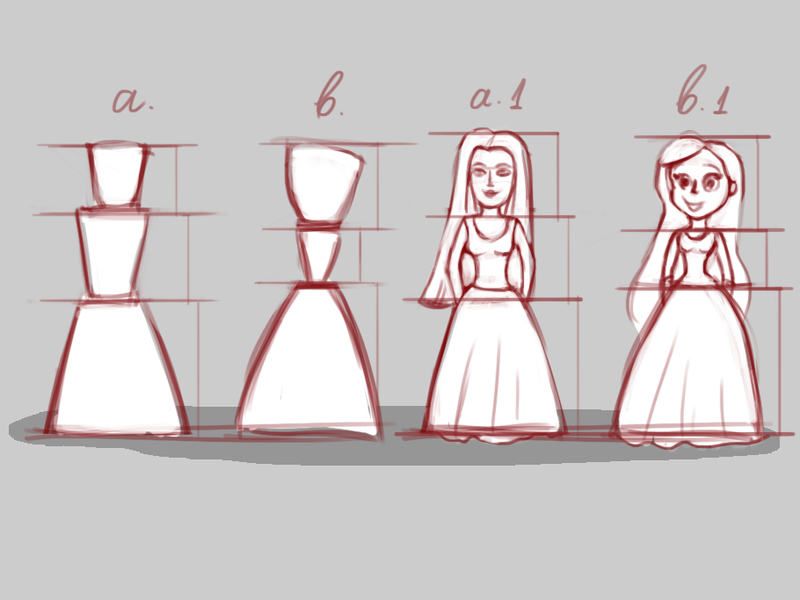 This rule is of the same importance for creating the details in the character, as it is for building the main shapes (a.1, b.1). Notice, how the second girl has big eyes and small nose, compared to the first girl, where her facial features are equal in size. How these 3 work together? Just remember to mix things up! Let’s give you one more example here. In picture a. , the shapes in the bear’s head are relatively equal in size and they are symmetrically placed within the face (similar to the first girl’s face above). We will try to do a little bit better in example b. 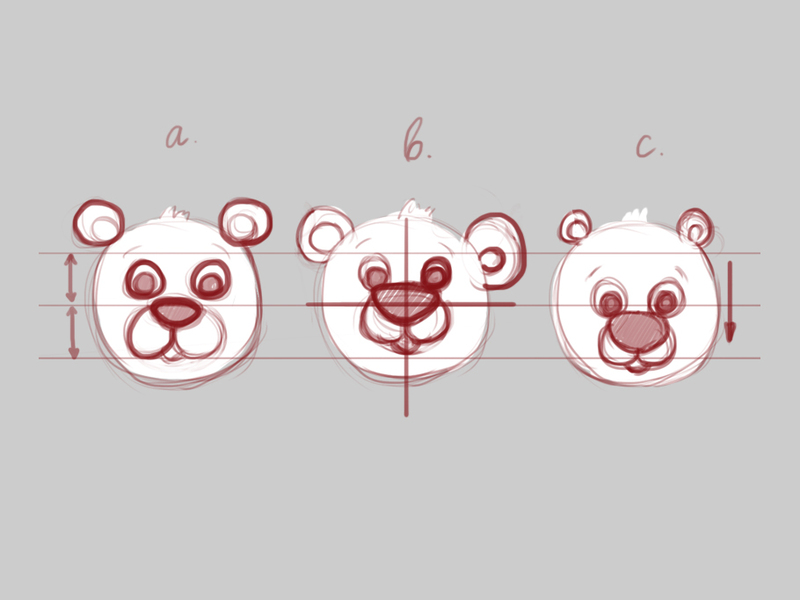 – here we change the size of the different elements in the bear’s head, but they are still in the center. Hmmm. Example c. is the best version, still using the exact same shapes! But why? 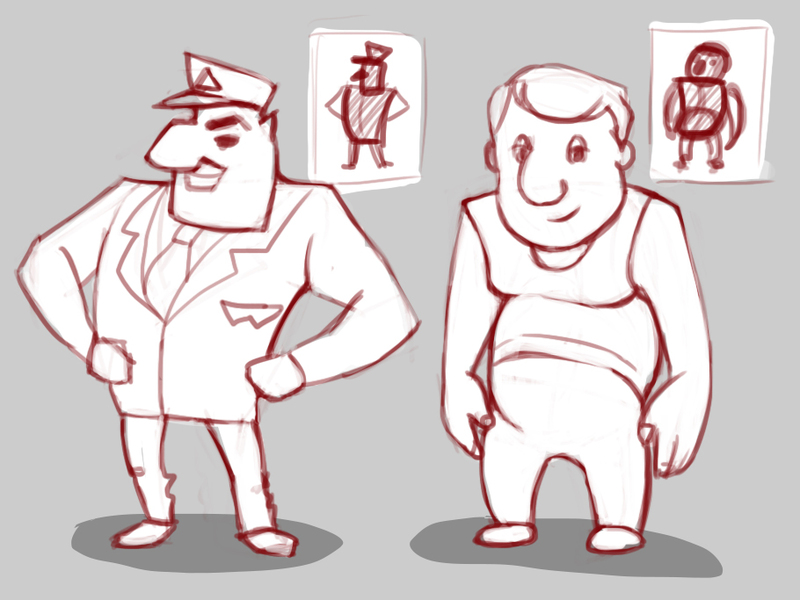 This time, we moved all the character’s features a little bit down, to break the symmetry in the face. Next, we varied just a little bit more the size of its eyes, ears, nose and so on. And we can probably safely say now, that we can read his character’s personality, only by looking at the shapes he is made of! We hope you liked this post! We have no other way of knowing, but by dropping us a line in the comment section below! If we’ve sparked your interest you might also like our other articles on character design at GraphicMama’s blog. 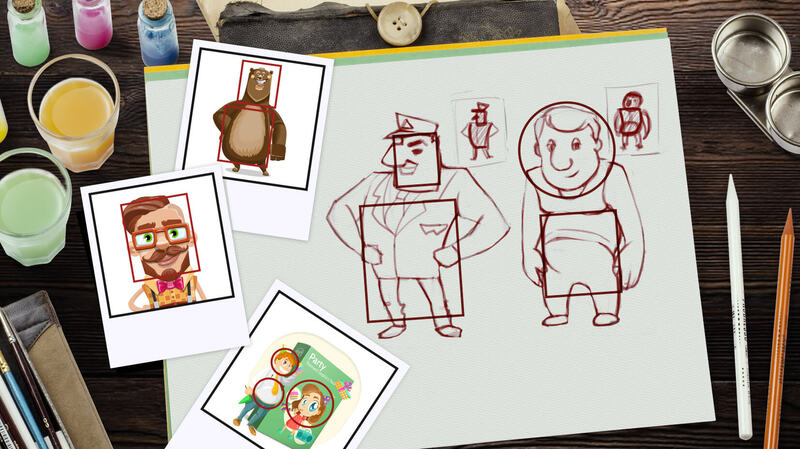 You can also put your fresh-baked knowledge to test, and use our characters at GraphicMama and Vector Characters to analyze their shapes, personality, etc. Oh, by the way, who’s your favorite character of all time? Can you tell us why? Can you tell how designers used the upper mentioned techniques to portray it’s personality? 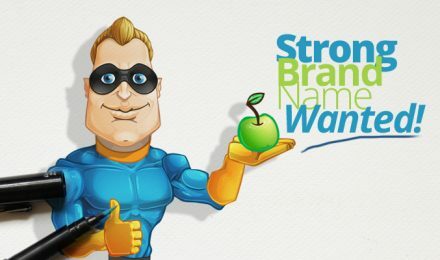 Red Alert: Strong Brand Name Wanted!